Who's smiling now? Both Leno and Letterman at the moment. 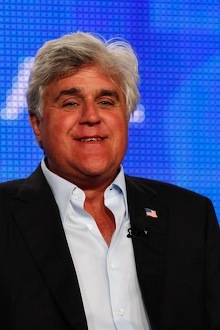 NBC's biggest prime-time gamble ever, The Jay Leno Show, has its inaugural musical guests inked. The Sept. 14th premiere will feature Jay-Z, Rihanna and Kanye West performing the Z-man's "Run This Town" from his "highly anticipated" new CD, "The Blueprint 3," conveniently in stores and online three days earlier. 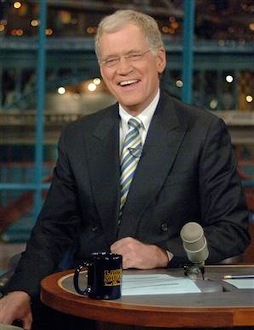 In the week of July 27-31, Letterman averaged 3.38 million viewers to O'Brien's 2.63 million. ABC's Nightline ran second opposite the first half-hours of Late Show and Tonight with 3.36 million viewers. O'Brien continues to win among advertiser-favored 18-to-49-year-olds, but his margin was just two-tenths of a rating point last week. Leno soundly beat Letterman in all audience demographics when he was at the Tonight throttle. CBS entertainment president Nina Tassler, in a Monday session with TV critics, said that Letterman will continue to benefit from the network's high-powered 9 p.m. (central) crime shows, which Leno will have to face. "He's very excited," she said of Letterman, who again declined to meet with critics. "So there will be great guest stars, great strategy leading up to his (fall) launch, but he's raring to go." Tassler said CBS feels "pretty confident" that Letterman can maintain his lead over O'Brien during the fall season. But then again, she never was much for words. ***On another late night front, Craig Ferguson and his post-Letterman Late Late Show at last will be joining the real world in HD. The switch takes place on Aug. 31st, CBS says. Letterman, O'Brien, Jimmy Fallon and Jimmy Kimmel already are in high-def. ***Dallas-based HDNet, owned by Mavericks maestro Mark Cuban, will carry five games during the United Football League's inaugural season. The first is set for Saturday, Oct. 10th at 6 p.m. (central). Cuban says that "fans are hungry for more professional football and we're thrilled to add the UFL to our great roster of championship sports coverage." ***CBS is replacing Guiding Light with a new version of Let's Make A Deal hosted by Wayne Brady. It'll premiere on Monday, Oct. 5th, with original host Monty Hall signing on as a token "creative consultant." "I will be walking with a big whip," Hall joshed during a session with TV critics. "Don't say 'whip' when a brother is sitting next to you," Brady rejoined. ***Amy Poehler, who will return to NBC's prime-time lineup with the second season of her Parks and Recreation series, has taken on the added burden of appearing with former desk mate Seth Meyers on the first two episodes of fall's Saturday Night Live: Weekend Update Thursday. She'll be on the Sept. 17th and 24th editions. The concluding August 23rd show will feature a surprise guest and Bill Nye as helpmate.